As you learn how to use ecommerce personalization to increase conversions and customer lifetime value, it’s important that you begin with the very first data cohort you already have access to: traffic sources. As an etailer, you should endeavor to avoid making generalizations on the intent of site visitors and traffic. After all, all traffic is not created equal. Some sources and segments of traffic are much more valuable than others. It is pertinent to understand traffic segments and serve each segment with its deserved attention. In the real world for instance, when you frequent a coffee shop, you typically get preferential treatment from the baristas who probably beat you to saying out loud your ‘usual’ order. Traffic or visitor segmentation is the first step in personalization because the closer you can get to at least the broad expectations of visitors, the more engaging an experience you can drive. The ability to serve tailored content to an otherwise anonymous segment of users (web traffic) is the first step in personalization. New visitors, returning visitors (non-customers) and returning visitors (customers): You want to make a clear distinction between new and returning visitors as well as go further by identifying returning visitors as either existing customers or non-purchasers. Traffic sources: Clearly segment visitors via the channels that they arrived from, i.e. email marketing, special offers, Pay Per Click (PPC), social, organic search and referral URL. Geo Location / IP address: Probably the most commonly used type of segmentation –– segment visitors by language, country, region, city and local weather condition. Behavior: There are a range of options here; segment visitors by returning and new visitors, drilling into returning visitors, you can further segment by days since first or previous visit. UTM parameters: You should also be able to use UTM parameters to segment by utm_source, utm_medium, utm_term, utm_content and utm_campaign. Device: Mobile, tablet or desktop. Other device specific parameters for segmentation include: operating system, browser name, screen width & height. After you have established the most important segments, you want to deliver personalized experiences to each by serving each traffic segment with dynamic content. So, from our traffic segmentation examples above, here are ways to serve each segment dynamic content. Traffic sources can tell you a lot about a buyer, including intent, interests and industry, as well as how close they are to purchase. By serving different content to visitors coming from different sources, you can increase the relevance of your messaging and motivate buyers through their buyer’s journey. Traffic from Amazon ads might have more intent than traffic from Facebook, so customizing landing pages by adding 1-time coupon codes or free next day shipping (as they would expect to see on Amazon) might tip the balance for conversions for that audience. Geo location targeting is founded on the IP address of visitors. The example below from FindTape.com recognized my UK IP address and made a currency switch recommendation to GBP (£). Naked Wines has a unique way to sell wine online to potential customers. Naked Wines welcome new visitors with an entirely different home page and navigation menu. This level of personalization of new first time visitors is optimized for on-boarding them as customers and members of their wine club. Signed in visitors are also made to feel at home with personalized messages addressing them by first name on the home page. Brands using BigCommerce can easily set up personalized experiences for customer groups –– including showcasing different pricing, different collections and even different discounts. This allows you to show your VIP customers new collections, while showing your wholesale customers their specific discount. Set it up once, and you’re done. One website. However many experience you want to offer. On SportsShoes.com, returning visitors (customers) are addressed by their first name around the shopping cart area. Landing pages can be personalized by any or a combination of these three parameters. All CRO platforms support running A/B split and multivariate tests with UTM tags. 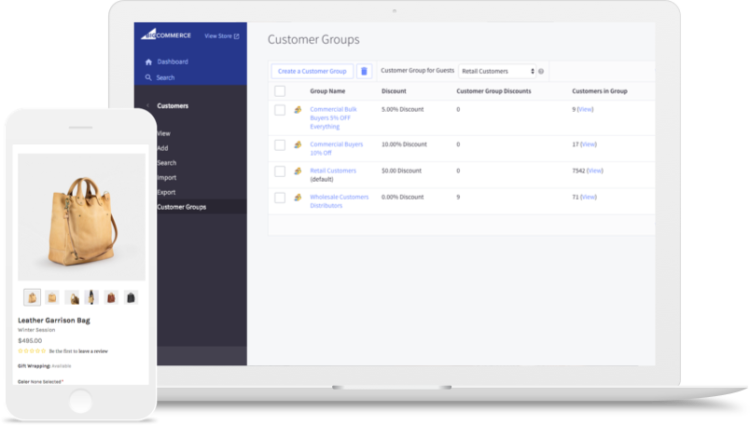 This is a screenshot from Optimizely, which is a one-click app for BigCommerce customers. With the rapid rise and ubiquitous use of mobile devices, device based personalization is a new fast growing ecommerce trend. Personalized content can be served based on device type and/or location. Mobile or tablet responsiveness or adaptive screens are now a given. The next frontier really is content tailored to mobile devices in a bid to drive conversions. The best performing mobile product pages are landing pages, driving high engagement and search rankings through product video, conversational descriptions and product reviews that serve as community generated content. Learn how to do the same for your business now. Merchandising of product catalog pages: Considering the fact that average order value (AOV) is typically lower on mobile devices as compared to desktops, you might want to consider listing lower priced products more prominently on category pages when mobile shoppers are browsing. Unify desktop browsing history: If returning shoppers log into their accounts via a mobile device, ensuring that their previous desktop browsing history is factored into the mobile browsing experience will unify their personalized browsing experience. Offer social logins: This will help to reduce friction at the point of account registration for first time mobile shoppers. Dynamically re-pricing products based on traffic segments and other factors such as time of the day and competitors’ prices is still a relatively new means and untapped area of ecommerce personalization. Only a handful of solutions currently offer dynamic pricing. At the enterprise level, Amazon and Staples have in the past charged shoppers different prices due to real time estimations of their incomes and geographic location. Amazon actually changes prices every 10 minutes. Other retailers such as Home Depot, Sears, JCPenney, Macy’s, Cheaptickets, Orbitz, Priceline, Expedia and Travelocity charge higher prices to online shoppers on Mac computers or Android devices. Online shoppers accessing Home Depot are ‘price steered,’ meaning that they are deliberately shown fewer search results of products in the more expensive price range when browsing category pages or viewing search results from mobile devices rather than a more extensive result listing if they browsed the the same category or search results from their desktop PCs. My findings show WiseDynamic by Wiser to be the only major solutions provider in the dynamic pricing space. They cater for both enterprise and mid-tier e-tailers. The WisePricer app for BigCommerce customers is made by the team at Wiser and does the same work as WiseDynamic. You can download it here. Now that you have a full grasp of the fundamentals of personalization based on traffic segments, the next phase of personalization –– which will be covered in the following chapter –– aims to go more granular by recognizing each shopper in varying degrees of detail and offering each shopper a personalized 1:1 experience.